It will bring any dull corner to life. Kings Brand Furniture Black / Walnut Kitchen Storage Corner Bakers Rack. 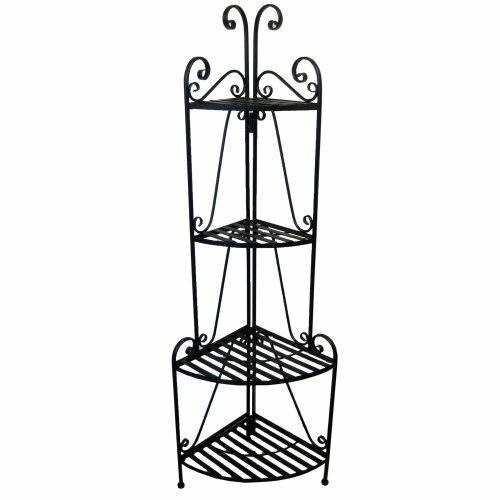 Maximize your ability to store and display items in your kitchen and dining area with this baker’s rack. 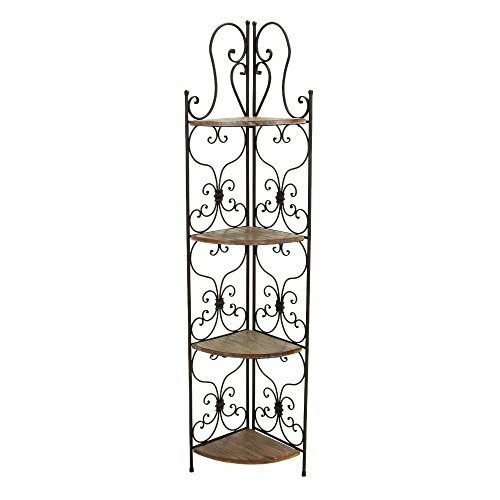 Material: Black finish metal tube with walnut finish wood shelves. 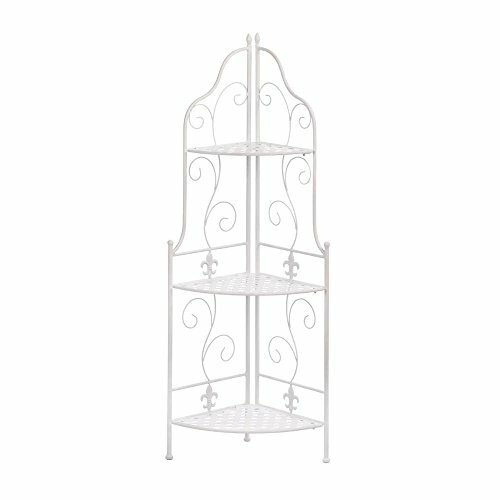 Enjoy a gorgeous addition to your home decor with this elegant corner rack. This beautiful decorative piece is crafted from high-quality metal and adds an attractive touch to any room in your home. Baker’s racks are usually made of rock iron or some kind of metal and traditionally used for cooling off baked goods. If you live in a condo or a small apartment, you’d understand the importance of utilizing space in your kitchen area. If you have an empty corner in your kitchen that can be used for storing kitchen essentials, freshly baked cookies, wine bottles, cookbooks and bric-a-brac, investing on a corner baker’s rack is totally worth it. The use of these racks isn’t just limited to kitchens. 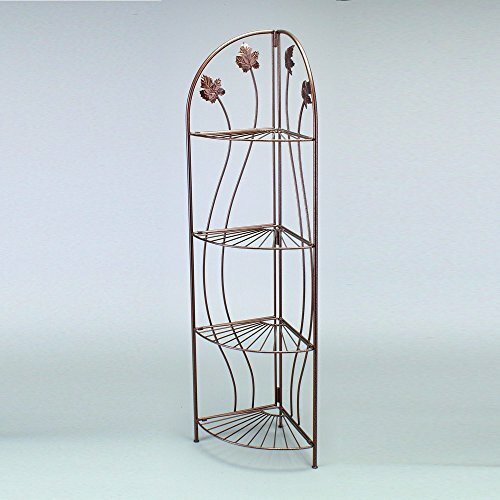 You can buy a fancy, decorative baker’s rack for your dining space or an outdoor baker’s rack to display plants or vases. Since the market will leave you spoilt for choices, we are here to make your work a little easier by narrowing down your options to 6 models. Don’t miss our next segment in which we have thoroughly reviewed our top 6 carefully chosen baker’s racks. 65" x 30" x 3"
VERDUGO’s contemporary design speaks volume of its state-of-the-art craftsmanship. It simply gels with the decor of any house- be it modern or rustic. The solid corner baker’s rack is made from a combination of metal and wood which adds to its durability. Let’s found out why this model made its way in our list of the best corner baker’s rack by competing with some of the most well-crafted products in the market. 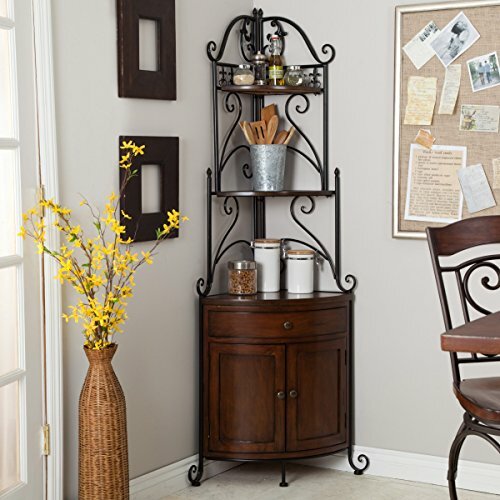 The antique baker’s rack flaunts a rusty finish which adds to its “oomph” factor. But looks are not the only thing we are after. The functional shelving unit can be effectively used displaying decorative plants, flower pots, towels, toilet papers in your bathroom. Although the rack isn’t that big, it will still serve as an additional storage unit in the tight corners of small kitchens. You can keep your cookbooks, fancy luncheon plates, glasses and trinkets on it. But if you are going to store something like a microwave on it, make sure the appliance is small. A reminder for you here-”this shelving unit is not designed to hold heavyweight objects” as pointed out by one of its users. So be careful about that. Moving on, another thing its existing owners like a lot is “its completely hassle-free setup”. Just take it out of the box, lock the shelves and voila! • Sturdy build comprising wood and metal. • Extremely easy to put together. • Fits snugly in the tight corners of kitchen, bathrooms and any other area in your house. Our second product isn’t lagging far behind VERDUGO as far as style, panache and usability are concerned. The rack is made of black metal tubes with elegant wooden shelves. Let’s quickly jump to the next section to find out what makes Kings Brand corner baker’s rack a class of its own. The closely-packaged design is a breeze to put together and it nicely fits in small kitchen spaces. You can use its top shelf to cool off your fresh, out-of-the-oven bread, cakes or cookies or maybe show off you fancy China plates, cups and teapot. According to a user, “the middle rack can be used for installing a small television set or microwave as well”. 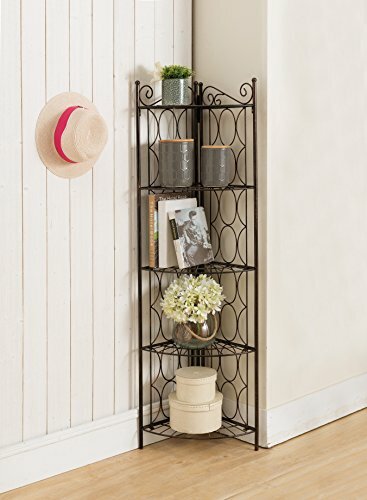 The 3-tier baker’s rack gives you ample of space to keep your books, flower vase, and other miscellaneous items which were struggling hard to find an empty space in your small condo or messy, crowded apartment. • Three walnut finish wood shelves. • Very easy to assemble. • 3-tiers add plenty of storage room in tight spaces. • You can put a small t.v or microwave in the middle rack. • Cannot be used to withstand heavy objects. 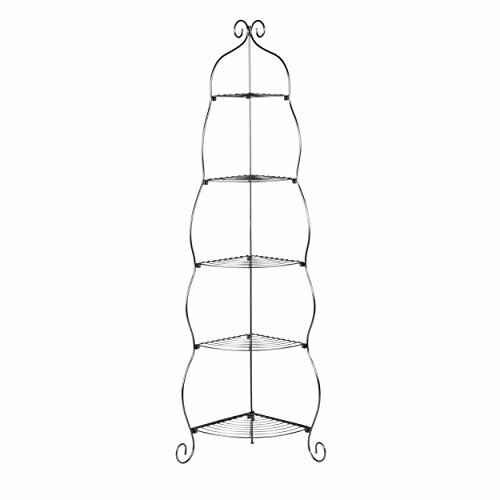 IF you're looking for a large corner bakers rack, this is the one for you. 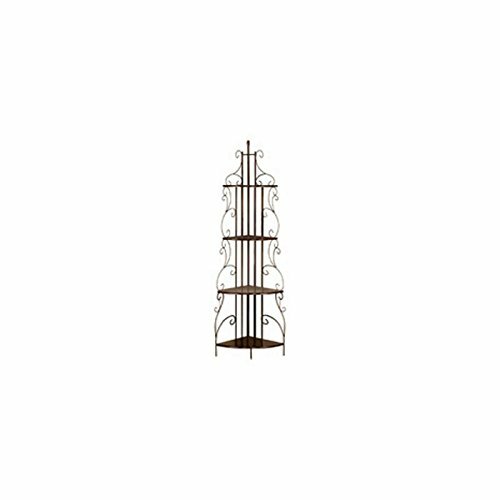 This wrought iron baker’s rack has a charming and antique vibe to it which is sure to anyone’s attention at the very first glance. With two open shelves, two enclosed shelves and a drawer, the Portica Corner Baker’s Rack can help you keep your kitchen essentials in the right place without cramming the cooking space. 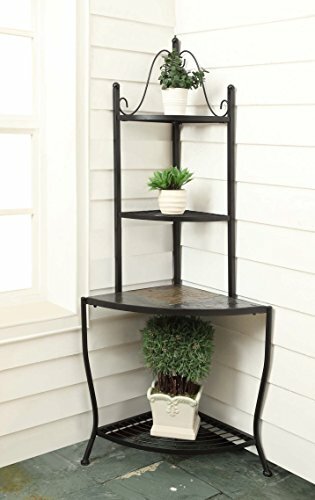 If you are not constrained by budget then shelling out a couple of extra bucks for this charming piece of functional shelving unit will be worth every penny of it. In a small kitchen with lots of appliances to store, this baker’s rack will give you an easy access to whatever you need while cooking. This works for those looking for a corner bakers rack with storage and a bakers rack with drawers. In addition, it satisfies the need of those seeking a corner bakers rack with cabinet. It will also add a dash of glamor to a quaint corner of your dining room or patio. 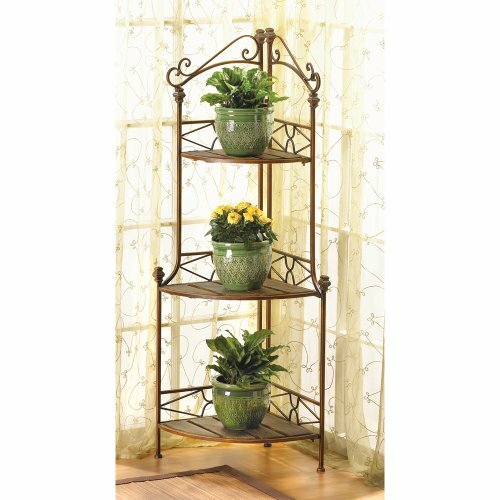 You can show off your family heirlooms, books, decorative plant and what not. The solid pine base can be used for storing pickle, jam jars, and canned goods. “Beautiful and simple to assemble” are what most of its users have to say about it. However, one user has complained that the rack is “wobbly” but this has to be product-specific as another user has stated that it rests steadily on a hardwood floor. • It is a baker’s rack with drawer, two open and two enclosed shelves. • Solid pine base for storing heavy jars and piles of books. • Wood racks can be used for cooling baked goods. • Rests unsteadily on the floor. Although, the defect is product-specific. 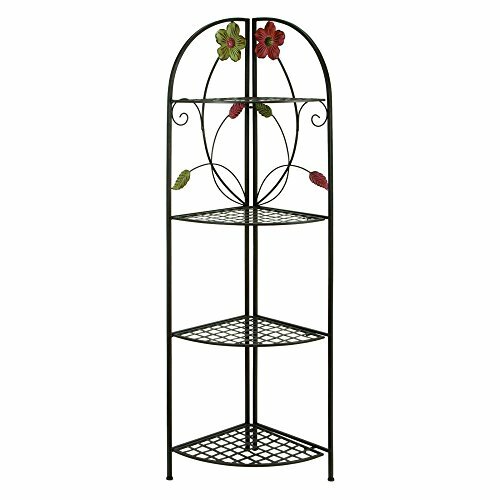 This ornate wrought iron baker’s rack is truly an eye-candy. This is also an attractive wooden bakers rack as well. It features exquisite scroll works and curves topped with oak and pine finish. You can even use the curves to hang your bracelets and your favorite scrunchies so that they don't go out of sight exactly when you need them. But there’s more to this beautiful looking baker’s rack than just that. The corner baker’s rack consists of a pull out drawer along with 4 wooden shelves. While most users have praised the rugged build and space-saving design, one customer has reported that installing the 4th shelve takes a bit of hard work. You can use the bottom two shelves and drawer for storing your nick-nacks, recipe books, glass or china plates and cups. The top two shelves can be used for displaying heirlooms like a vase, small pictures, scented candles, decorative plants and so on. The rack isn’t that heavy, so make sure to anchor it down to the floor properly so that it doesn’t tip over. Users have also loved the fact that this piece takes a very small space and gets assembled in a jiffy. • Ample of storage with 4 shelves and a drawer. • Fits easily and snugly in tight corners. • Intricate and elegant scrollwork. • Fitting the fourth shelf is slightly challenging. Seeking an outdoor corner bakers rack? 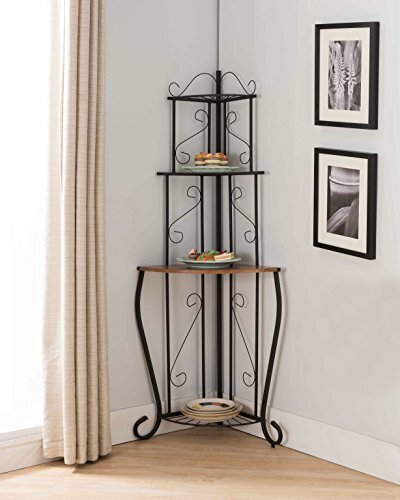 The sturdiness of this baker’s rack comes from its metal finish and thick metal shelves. The body of the baker’s rack is treated with a rust-resistance and a water-resistance powder coating. So if you decide to use it as an outdoor baker’s rack, it is not going to lose its oh-so-classic appearance to the vagaries of weather. One of its users said that the model is “great for small patio” and we can’t agree more. It is essentially an Etegere-style baker’s rack, the kind our French folks use to display ornaments. It serves another purpose too. You can fold the entire rack easily to relocate it from your room to the patio and vice versa in a snap. The rock solid metal panels can hold the weight of several heavy objects such as flower pots, television set and so on. Just make sure to place your nick-nacks right at the center of the panels. This will not only reduce the risk of tipping overr but also help the panels hold their shape. Another thing its users are extremely satisfied with is the “space between each shelf”. This means you can keep tall objects even in the middle and bottom racks (there are 4 of them by the way). The customers are also quite pleased with the ease of setup. However, while the corner baker’s rack can effectively combat weather elements, to extend its longevity, you should try keeping it indoors as much as possible. Since the rack can be transported easily, this shouldn’t be a problem, should it? • Ample of space between each space to place tall objects. • Anti-resistance and waterproof coating for outdoor use. • 4 metal shelves and a sturdy metal body. • Can hold quite a lot of objects. • You need to carefully place the objects at the center to avoid tipping risk. 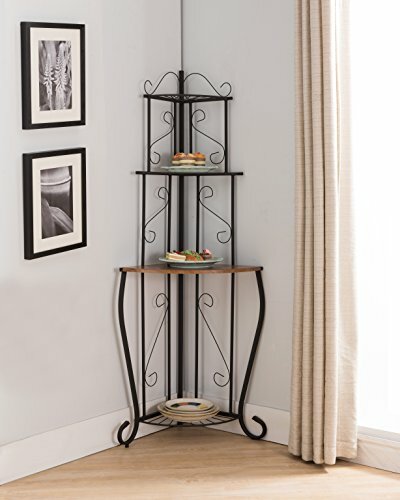 This brilliantly crafted corner baker’s rack will easily find its place in any nook and cranny of your living room or in a cluttered kitchen. The large slate top is not just there for cosmetic purpose. There’s a 12-inch gap between this tile shelf and the one above it, so you shouldn’t have any issue with keeping tall plants on it. “Very easy to put together and seems very sturdy” is what of its users have to say about this baker’s rack and we completely agree with that. The package comes with an assortment of screws and nuts to set the frame. You don’t need professional tools to assemble this bad boy. The sculpted metal body and shelves are powder-coated, therefore long exposure to sun or water won’t tarnish its appearance. You can keep it on your outdoor porch or patio to show off your collection of bonsai, beautiful flower vase and keep your geegaws. We bet whoever looks at it won’t be able to help but praise your taste. 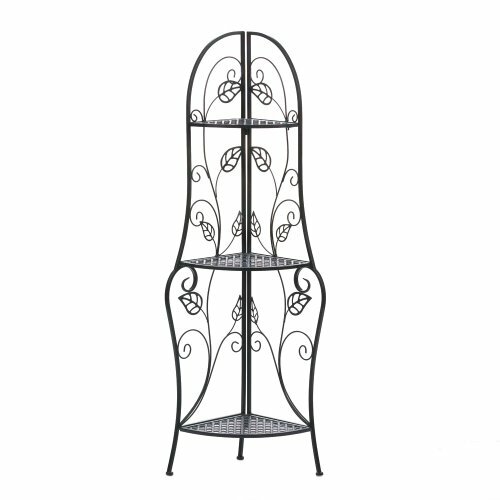 It is one of the biggest outdoor corner baker’s rack you can find in its price-point. We guess for all these reasons, one of its users said: “this is a must-have”. After all, the unit sets up in a jiffy, it doesn’t take much space, the 12” inches gap between two shelves and it can be used outdoors too- all these without leaving a dent in your wallet. What else can you ask for? • Large shelves, enough gap between two slots. • Slate top adds to the beauty of this magnificent piece of craft. • Strong metal shelves can hold a lot of weight. • Can be set up in a jiffy. • The slate top is only meant for keeping lightweight objects. 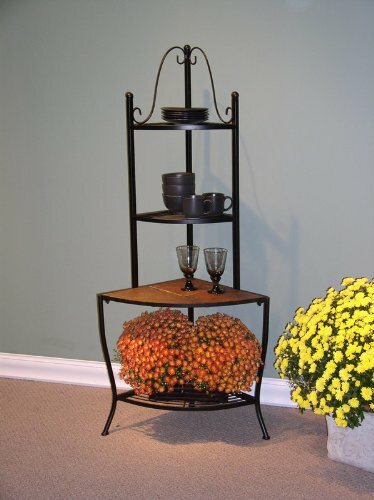 What To Look For While Buying a Corner Baker's Rack? You just don’t see a product in the shop or on the internet and buy it because looks cool. Be it clothes or shoes or anything else. You consider several aspects like price, durability, fittings etc. So when you are out for buying a corner baker’s rack, don’t jump into a conclusion before taking into account a few important aspects. What these aspects are, you ask? Keep reading. Look and Feel When it comes buying a furniture that’ll be open to display for everyone, looks do matter. The design should be in a perfect harmony with the decor of your kitchen or wherever you decide to put it. Apart from the appearance, you also need to consider the functional aspect and durability of the baker’s rack. The shelving unit should be sturdy enough to keep your important stuff and nick-nacks. While some models are primarily designed for displaying lightweight objects like flower vase, candles, photo albums and so on, some provide adequate space and strength to hold microwaves, heavy China crockery and the likes. The best model for you will be the one that fits both your budget and storage needs. 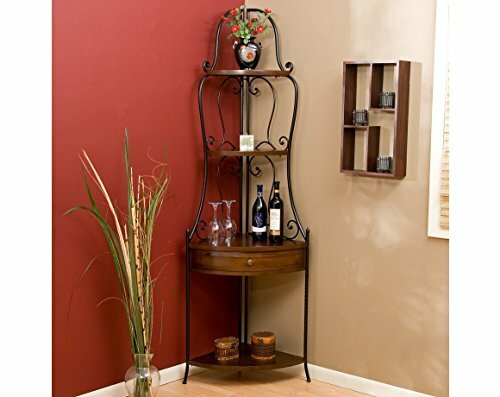 For example, if you are a wine connoisseur, you should go for a baker’s rack with wine rack. 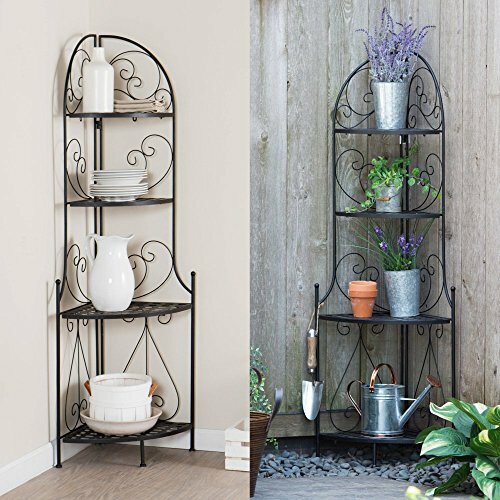 Those who want to effectively utilize the empty space in the patio to show off their enviable collection of plants should opt for an outdoor baker’s rack plant stand. Similarly, if your storage needs are very limited or you just want to enhance the appearance of your kitchen or bathroom, a small baker’s rack will do just fine. 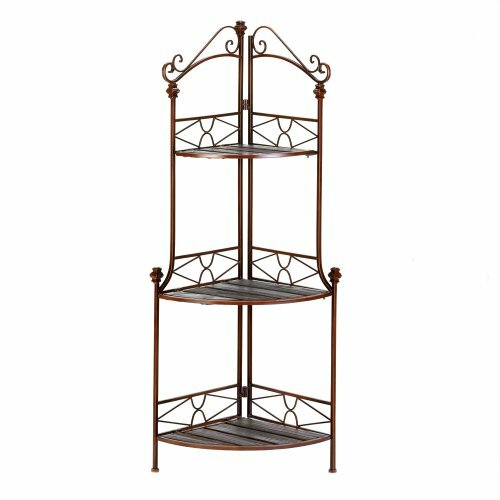 Material Corner baker’s racks are made of various materials like wood, die-cast aluminum, wrought iron and other types of metal. Ideally, the frame should be sculpted from a powder-coated metal, especially if you are going to keep it outdoors. Wooden racks are a timeless beauty. As long as the wood is durable, it will stand of the test of time and every other challenge you might put it through. Storage Space The main reason to buy a baker’s rack is to maximize the dead space in your home. The size of the rack and the gap between each shelf decide the weight, height, and the number of stuff it can hold. If you are purchasing a rack to organize your cluttered kitchen, then look for a 4 or 5-tier model which can provide plenty of storage for your kitchen appliances, cookbooks, crockery. You can also use one of the shelves as a cooling rack to cool off your freshly baked cheesecake before putting it into the freezer. Pocket-pinch Now, this is definitely the first thing almost everyone considers before buying anything, be it kitchen appliances or a rack that holds them in place. There’s simply no point in splurging on a 5-tier metal baker’s rack flaunting magnificent scrollwork when, practically, you only need a small rack for storing nick nacks. However, that doesn’t mean we are encouraging you to opt for a cheap model. The main deciding factors of a baker’s rack price are the material it is made of, number of shelves, the size of the rack and quality of construction. So before buying any model, figure out how much value for money the product is by comparing several products’ key features side by side. We value your hard earned money, so should you. The Bottom Line Buying the best corner baker’s rack for your storage needs is no easy feat. We understand and that’s why we have gone all the way to make our reviews as thorough and authentic as possible. Our research team has spent relentless hours looking for the top models that tick all the right boxes. But buying a piece of furniture as important as this is no cakewalk. It will need some effort from your end too. We have laid the groundwork for you. Now it’s time for your due diligence. Read the reviews, consider the factors that separate a good baker’s rack from a great one, trust your guts and then only you’ll be ready to click the “Buy Now” option. That’s all for today.Toodles!